Dealing a heavy blow to Pakistan’s embattled government, the Supreme Court on Monday initiated contempt proceedings against Prime Minister Yousuf Raza Gilani for refusing to revive a long-standing corruption case against the nation’s president. Gilani, a top ally of President Asif Ali Zardari in the ruling Pakistan People’s Party, must appear before the court Thursday, when the justices will listen to his explanation for not going ahead with the case. If the court moves forward with the contempt proceedings and Gilani is convicted, he could be disqualified from office and forced to step down. He also could be forced to serve up to six months in jail. Zardari’s government is locked in battles with the Supreme Court and Pakistan’s powerful military, both of which have had an acrimonious relationship with the president since he took office in 2008. The crisis has stirred talk of the government’s possible ouster, though experts say it probably would happen through legal action taken by the high court rather than a military coup. The military has ousted civilian leaders in coups four times in Pakistan’s 65-year history, but military generals have said they have no plans to mount a takeover. Nevertheless, they were deeply angered by an unsigned memo that a Pakistani American businessman contends was engineered by a top Zardari ally to seek Washington’s help in preventing a military coup last spring. In exchange, the memo offered several concessions, including the elimination of a wing of the Inter-Services Intelligence agency that maintains links with Afghan insurgent groups. The businessman, Mansoor Ijaz, says the then-ambassador to the U.S., Husain Haqqani, approached him with the idea. Haqqani, who was forced to resign after the allegations surfaced, denies any involvement in the creation or conveyance of the memo. A Supreme Court commission is investigating the case, and on Monday it ordered Ijaz to come to Pakistan and appear before the panel Jan. 24. The high court’s move to start contempt proceedings against Gilani involves money-laundering charges in Switzerland that Zardari was convicted of in absentia in 2003. The case was appealed by Zardari and his late wife, former Prime Minister Benazir Bhutto, and was later dropped at the request of the Pakistani government in 2008. Since 2009, Pakistan’s high court has repeatedly ordered the government to write a letter to Swiss authorities asking that the case be reopened. Gilani and government lawyers have refused, arguing that as president, Zardari enjoys constitutional immunity from prosecution. Last week, the court warned Gilani that it could remove him from office if he did not abide by its demand. Government lawyers were supposed to appear in court Monday and explain why Gilani’s administration had ignored the court. Instead, Atty. Gen. Maulvi Anwarul Haq appeared before a packed courtroom and told a high court panel that the government had not given him any instructions about what to say in court. The head of the panel, Justice Nasir Mulk, said Gilani’s inaction gave the court no recourse but to pursue a contempt case against him. Before the court issues its findings, it probably would hold evidentiary hearings, Haq said. If Gilani on Thursday tells the court he will ask Swiss authorities to reopen the corruption case, the justices probably would consider dropping the contempt proceeding, said Tariq Mehmood, a lawyer and retired judge. 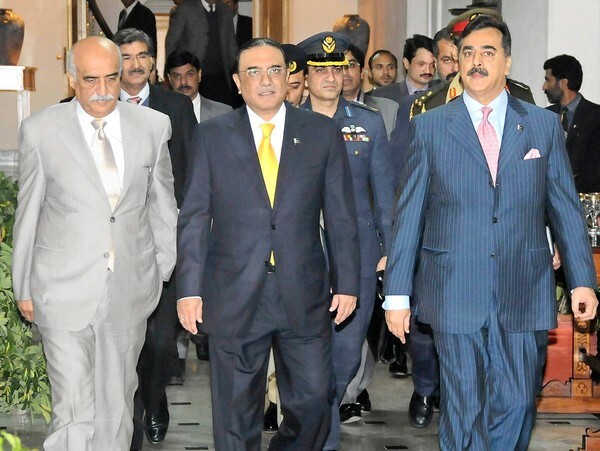 Zardari’s administration hopes to become the first civilian government to finish out its term, which ends in 2013. The political turmoil may thwart that plan, as opposition leaders increasingly push harder for early elections. Though Zardari is widely criticized in Pakistan for failing to revive the country’s moribund economy and tackle corruption, his party remains confident that it can weather the storm and retain power for a second term. Even if Gilani is removed from office, Zardari continues to hold together a coalition that controls parliament’s lower house, which elects the prime minister. On Monday, however, Interior Minister Rehman Malik, a staunch ally of the president, doubted it would come to that. Rahman Malik is always right because he never tells lies. Hence remain vindicated. I request to chief justice of pakistan that give the order to prime minister to resign , we have no need crrupt leaders. Thank you . Is he the only corrupt one?